Every year since I've been with Nik (almost 10 years now), we've celebrated Christmas with his family. And I love it, I truly do, but ever since we had the twins, I've really wanted to have a quiet family Christmas at home, just the four of us. It's how I remember my own childhood Christmases with my brother and parents, a special day just for us with just a few set traditions and nothing else to worry about like packing and driving, not even worrying about timings too much as it's just us and we can let the day flow. On Christmas Eve, we had a lovely snuggle chilled out day at home and a special breakfast. Nik made pancakes with bacon and maple syrup (something they never usually get, there have been a lot of Christmas treats) which was delicious! We attempted building a gingerbread house from a kit but it was a bit of a disaster and ended up getting abandoned when we all got fed up! In the evening, we had the Christmas Eve box ready for the kids after their nap. This is something I started a few years ago and fill it with new PJs, a Christmas film, popcorn, stuff to make hot chocolate - all ingredients for a cosy Christmas Eve snuggled on the sofa. This year I filled it with all of the above plus the gorgeous elves James Anderson gave me when I bought some boxes in Allsorts, I couldn't decide whether to choose the girl or boy since I have one of each twins so he gave me both, so sweet and they LOVE them! We settled down with our popcorn and watched A Muppet Christmas Carol under a blanket all together on the sofa, bliss. We had another special, but more simple, breakfast of smoked salmon and scrambled eggs with toast before getting dressed up for tree presents! We had salmon blinis, Christmas ham and cheese for lunch and Nik and I started on the Christmas dinner prep (and the cocktails - check out the recipes here) while the twins napped. We're not massive fans of Turkey and I never had it growing up so this year we opted for lamb cutlets but with all the usual trimmings we love. Admittedly I made a rubbish effort at decorating the table this year, I was busy spraying everything gold for the guest room instead! We all had a brilliant day and although we missed family, we did have some fun video chats with the in-laws in London and my parents in Malaysia. 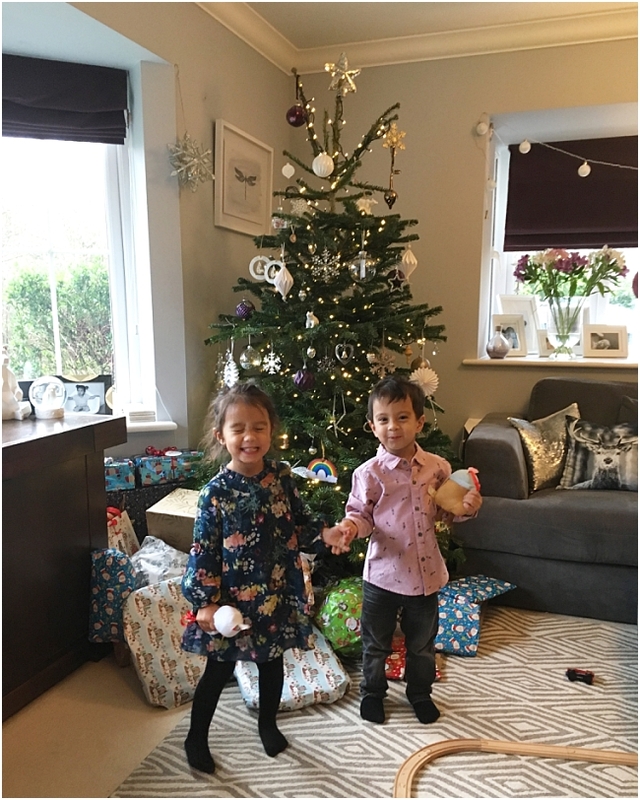 The kids had fun playing with their new toys, I had fun putting their new lights together and sorting out homes for everything and we just enjoyed being together with minimal chaos after such a busy year. It's been quite rare that we just have time alone at home with the four of us so to do so for the big day was especially important to me this year and it was so magical with the twins being 3 and getting into it so much more. What are your traditions for Christmas? Do you always spend it with the rest of your family or just have a quiet one at home? I'd love to know! Thanks Lorri, it was via McDonalds actually! I saw someone else do it on Facebook and there was a link to the McDonalds website to upload your photo - linked to their carrots for reindeer ad this year. Don't know if they'll be doing it again. Looks like everyone had a really great Christmas, especially the little ones. I enjoyed a lot this year as well. Unfortunately I was away from my family, but I was with great friends in one of the best event venue space New York has. It was fun!